The quick digital transformation of society is happening right in front of our eyes. 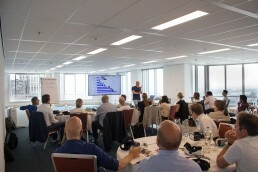 To keep up, Strategy Works, a consultancy company based in Rotterdam, organised a masterclass of two days for the company Salesforce. Strategy Works wanted to give the employees of Salesforce a better insight in different sectors and the development of concepts for them. Among those concepts were VR and AR concepts. For the masterclass a 3 hour long program was set up where all facets of VR and AR were explained. The VR Owl event team made sure that during the first half of the masterclass there were VR headsets available and that all attendees could play VR content using the Look & Play software. During the second half of the masterclass smartphones were available to view AR demos. Different VR and AR content was shown for different sectors, among which, technology, healthcare and marketing. 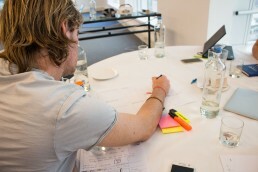 After every part of the masterclass the attendees got to develop a concept for a particular sector themselves. After that, the concepts got presented and feedback was given. The attendees were excited about the masterclass. They also spoke out their wishes to work together again in the future. They liked the combination of theory and practice during the masterclass. By translating the acquired knowledge into a project, VR and AR was made more accessible to the attendees.